If you've been around nail polish for awhile you'll remember Floam. Floam is what in my opinion jump started the indie craze. This was a polish that was composed of neon matte glitters. I know neon matte glitters doesn't sound really innovative now, but 3 years ago this was unheard of in nail polish. 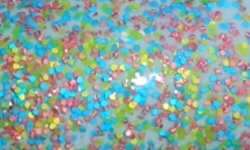 The advent of Floam spurred on the arrival of more Floam like glitters in various different colors. One of those was Pinkerbell made my Ninja Polish. Pinkerbell is a mix of bight blue, yellow, and pink matte glitters in a clear base. Color: I love this color combination in this glitter. It's very sweet and girly, but fun at the same time. It's a great mix of colors where all colors equally shine. Formula: The formula on this is OK. 2015 indie formulations are a lot better than 2012 formulations. I used 2 coats above, and I had to layer it. The formula is a on the thick side, and I found I really had to dab this glitter on rather than paint it on. Price: This is $10 on the Ninja Polish website. Overall: I really like Pinkerbell it's an old school indie favorite. I love the colors and type of glitter. The formula at the time was good, but compared to indie formulas now, it does have some pitfalls. I don't think that's a deal breaker at all though. Pinkerbell still gets love from me! Still gets love from me too! The color combination in Pinkerbell is delicious and I love it over the Sally Hansen blue you chose. Fun glitter! I'm usually not a fan of small glitters like this one but it looks great. I remember so wanting Floam when I first got into polish! That was about 2 and a half years ago so I guess it was already old news. Now like you say there are just SO many options!